There is no getting around the fact that building muscle, and eating properly is hard and can really take a toll on our motivation at times. This is especially true when we do not see immediate results, or our expected results are delayed a bit. The key to building muscle on top of proper nutrition and exercise is of course consistency. Those who never give up will in the end succeed. There are a few ways that I personally use to stay motivated that I have found to work very well. I am going to share these few things with you so that hopefully you can use these tips to stay on track and continue on your journey to building an impressive muscular physique. One of the best ways you can stay motivated is to see positive changes in both your size and strength. However, because these changes can happen in very small amounts you can sometimes overlook them or miss them altogether. This is why it is important to make logs and take pictures. By keeping track of your weight, body part sizes, weight amounts reps and sets you can see small changes. That’s right if you are feeling down about building muscle, and feel as though you will never be able to do it then take a look at all of the personal transformations that others have gone through. This may sound weird to you at first but when you begin to see obese, overweight, or skinny people just like you changing their bodies forever, and getting to see how they did it can be all the motivation you will need to get back on the horse and continue down the road to reaching your muscle building goals. This is actually a tip that you should take very seriously if you are considering it. The reason I say that is that a lot of times working out with a friend can turn into play time at the gym and your workout becomes a total waste of time. Working out with a friend can be very rewarding if they have the same drive and goals that you do. It is important that you pick a friend that is going to be a friend outside the gym and a motivator in the gym. These are the 3 main things I use to keep motivated in the gym. 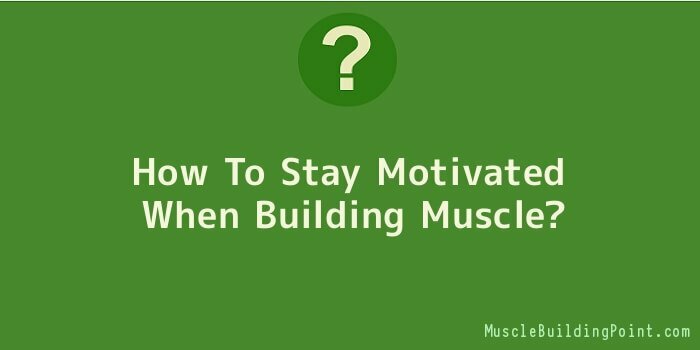 Remember that motivation can be a very helpful tool in your efforts to building muscle. I hope that these tips will help to keep you motivated and keep you travelling down the road to a massive muscular physique.